This Venus Blindfolds Cupid tapestry, we see a tapestry based on the work of Tiziano Vecellion (1488-1756). Tiziano, also known as Titian, the great Italian painter in the Venetian school style of art. The work, Venus Blindfolding Cupid, shows the work from 1565, also known as The Graces, of which the original is now in the Galleria Borghese in Rome. Cupid is depicted as blindfolded, which is to mean that love is arbitrary, that is, love can be influenced by factors which can so strongly influence the beholder. The three graces in Greek mythology refer to the goddesses of beauty, charm and creativity. Here these goddesses are blindfolding the young cupid which has his wings visible on his back. The reds and blues in the piece contrast and balance beautifully with the orange skies. 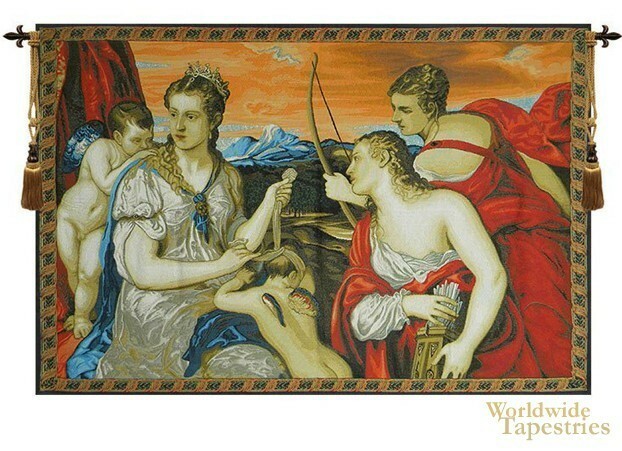 This Venus Blindfolds Cupid tapestry is backed with lining and tunnel for easy hanging. Note: tapestry rod and tassels, where pictured, are purchased separately. Dimensions: W 37" x H 25"